As any elementary school student can attest, snack time is an important part of the day. CSS students David Gehlen, '16, and Ben Baltich, '14, can't help but agree, as a recent snack time of theirs inspired a pretty sweet idea. "We went to this retreat at St. John's last winter and for a snack they had this wonderful honey, this St. John's honey," Gehlen said. "We were joking around about how cool it would be to have a CSS honey." And now that joke is starting to become a reality. After the retreat, Gehlen started researching and, after receiving permission, formed "The Bee's Knees" — a club centered around beekeeping — with Baltich, a fellow marketing and management major. To start it, Gehlen, Baltich and faculty advisor Dr. Mary Lou Donovan — an assistant professor of occupational therapy and a hobby beekeeper — ordered the bees, assembled the wooden box and frames that they make their hives in, and introduced them to their new home. The queen was then placed in its own separate box, covered on one end by a marshmallow, so that the rest of the hive could acclimate to her while she ate her way out. The bees now work mostly independently, with the club checking in every 10 days or so during the summer to feed them and make sure the hive is functioning properly. All with only a couple of stings — at least so far. "It's really interesting seeing these tiny creatures doing such cohesive work together," Baltich said. "It kind of makes you wonder why people aren't more cohesive when it comes to doing jobs. It's inspiring in a weird way." They also find inspiration in beekeeping's link to the school's Benedictine roots. In the early 20th century, Karl Kehrle — a Benedictine monk at Buckfast Abbey in England who went by the name "Brother Adam" — isolated the Abbey's population of bees and bred them for pest and disease resistance as well as cold tolerance. Thus his own strain of bee, the Buckfast bee, was born — which people still use today. 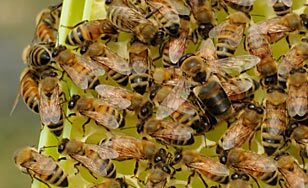 Considering that over the past several decades, the number of crops that depend on bees for pollination has quadrupled while the number of hives available to pollinate has dropped by half,* this relationship between bees and Benedictine values is a perfect fit. "Beekeeping is all about stewardship — taking care of nature's resources and educating others to do the same — and it seems like a good thing for us to do here at St. Scholastica," Gehlen said. * "Nature's Dying Migrant Worker and Bee Battle Seeks Hearts and Minds." Josephine Marcotty. Star Tribune. This video clip illustrates how worker bees fan the hive. They cool it by directing airflow into the hive or out. Get a behind-the-scenes look at the Bee's Knees in action. View gallery. Learn more about becoming a part of the Bee’s Knees club by emailing David Gehlen at dgehlen@css.edu.